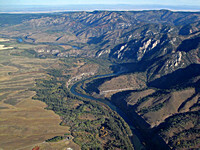 The Blackfoot River valley is part of the Greater Yellowstone Ecosystem, home to hundreds of species of wildlife, including moose, elk, mule deer, gray wolf and lynx. The river is home to Yellowstone cutthroat trout. These wildlands are widely recognized by scientists across the nation and in Idaho for their biological diversity and importance. 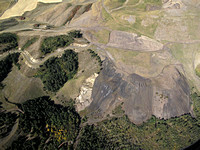 The region has seen impacts from dozens of phosphate mines, around half of which are Superfund sites. 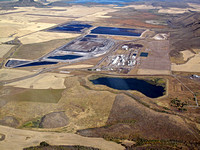 A Superfund site refers to a mine that is causing or has caused contamination, where the responsible party is being asked to clean up their impact to the area. Selenium discharged from phosphate mines is a toxic chemical which can harm fish, wildlife and livestock once it contaminates water sources. Over 151 miles of streams in the area have been listed by the Idaho Department of Environmental Quality as contaminated by unsafe levels of selenium. More than 600 head of livestock in the Blackfoot watershed have died as a result of selenium poisoning and degraded water quality is having impacts on aquatic wildlife. Trout with two heads and various other mutations were found in streams and documented by a scientific study commissioned by the J. R. Simplot Company, whose mining operations have polluted nearby creeks in southern Idaho. The trout were the offspring of local fish caught in the wild that had been spawned in the laboratory. Some had two heads; others had facial, fin and egg deformities. Yet the company’s report concluded that it would be safe to allow selenium —which is toxic to fish and birds — to remain in area creeks at higher levels than are now permitted under regulatory guidelines. 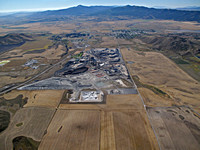 The company is seeking a judgment to that effect from the Environmental Protection Agency. 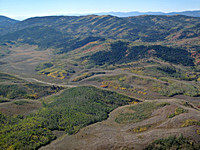 In Spring, 2012 EcoFlight flew the Greater Yellowstone Coalition and reporters from The Daily Show with Jon Stewart to do a story on populations of trout with deformities due to selenium poisoning. 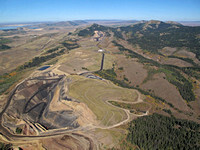 The BLM is considering development of more phosphate mines in the area, including one inside of the Blackfoot River Wildlife Management Area which was set aside to protect populations of Yellowstone cutthroat trout, and another in the Huckleberry Basin Roadless Area. With the amount of contamination and impacts from phosphate mining yet to be cleaned up in the area, groups are working with agency and industry officials to ensure the proper clean-up of Superfund sites, and to halt further development until that happens.